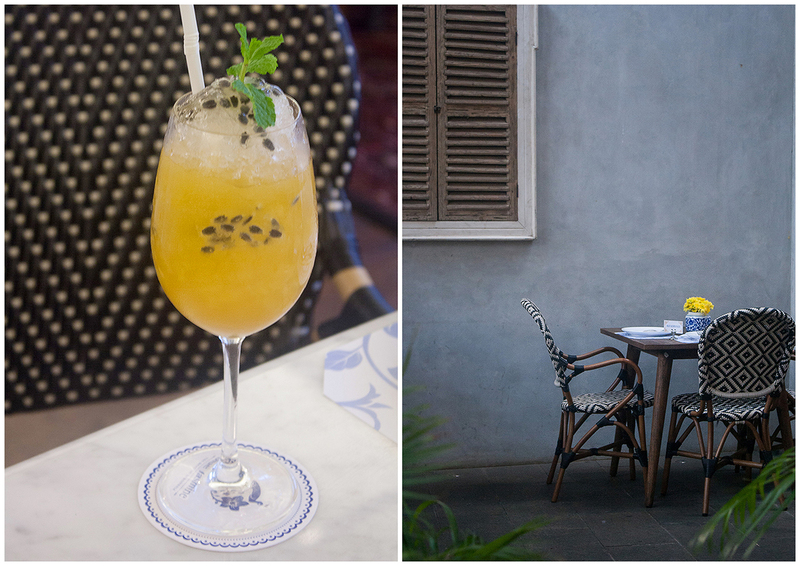 Blue Jasmine is an Indo-Orient restaurant tucked inside The Maja building in Kebayoran Baru, South Jakarta. Located in a busy street exactly across Pasar Taman Puring,The Maja building looks quite striking. European style building dominated with black colour with some white accent, and many windows make this building easily recognisable. Blue Jasmine is a small blue flower with sweet fragrance that only exist in a whimsical world. The name was chosen because Blue Jasmine is non-existent in a relation to the concept itself being a re-interpretation of sentimental favourites into modern classics a la Blue Jasmine. The flower Jasmine was chosen as it has a wide spectrum in Indonesia traditions; it is the flower of life, beauty and festive wedding. It symbolises purity, sacredness, graceful simplicity and sincerity. That day Me and Ditasoe come for afternoon tea. We arrived around 5.30 pm, I know it’s a little late from our schedule but the staff still very friendly and directed us to our table in an indoor dining room because the outdoor room is already full. While waiting our tea come we take some pictures. 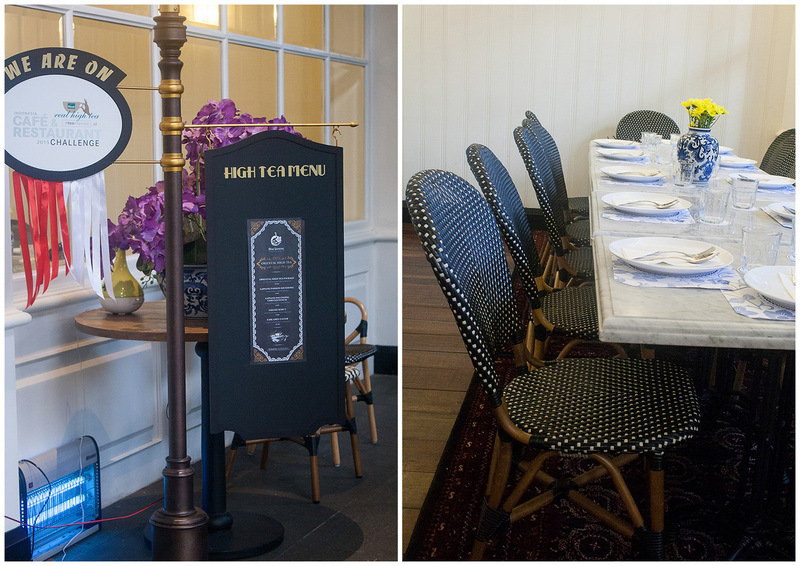 Every Monday to Friday Blue Jasmine restaurant provide afternoon tea from 3 to 6 pm for only IDR 199k for two person. They choose an oriental theme for their afternoon tea. 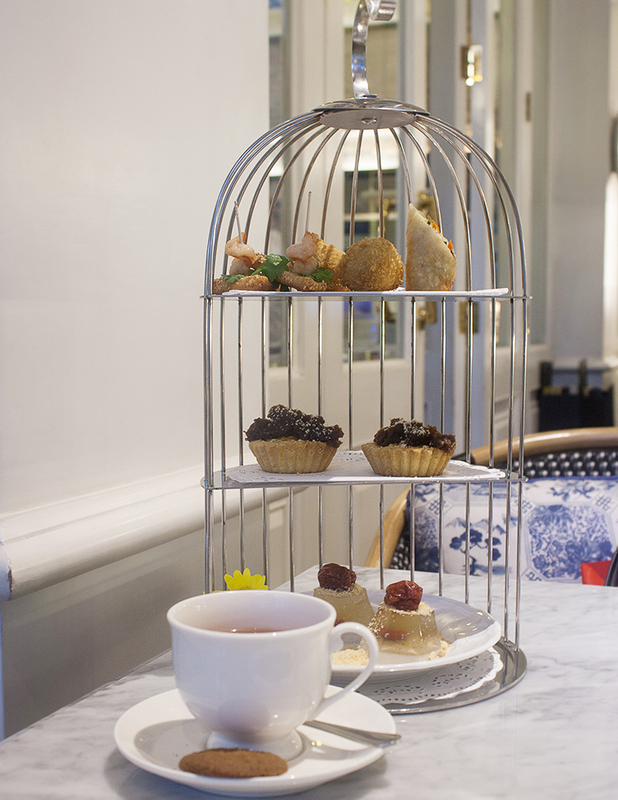 Each afternoon tea set include sweet and savoury pastry and for the drink you can choose hot Lapsang Souchong Chrysanthemum or hot Jasmine tea with Rose Petal. 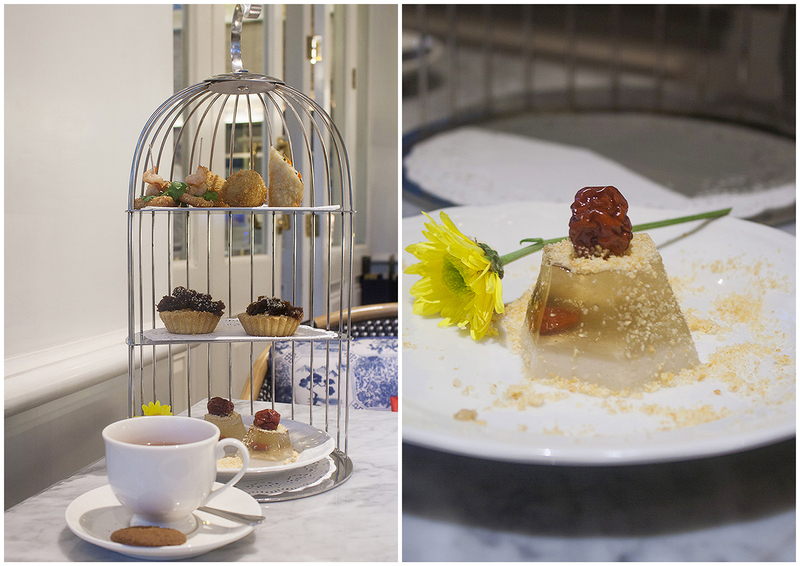 The Oriental High Tea set served on a three-tiered cage stand which consist of two chrysanthemum jellies, two-single serving pie with sweet filling, and assorted delicious savoury treats on top of tower. The chrysanthemum jelly had a strong influences from Chinese cuisines you can see it from the addition of longan and goji berry, it not too sweet and the sugar dust (crumble) add unique texture. Pie Tape (Fermented Cassava Pie) represent the Indonesian cuisine, tape or fermented cassava and unti (grated coconut with palm sugar) is often use on Indonesian desserts. They success make unique dishes by combining western pastry with Indonesian ingredients. Fermented cassava has a slightly natural sour and sweet taste from the addition of yeast during the fermentation process, while the unti sweet and a bit sticky and it nicely combine with flaky pie. Indonesian love deep fried snack and Blue Jasmine serve three kind mouthwatering savoury snacks. The savoury treats consist of spring roll cut into two pieces, two prawn breads and also two bitterbalen. My favourite was prawn bread, triangle shape white bread with minced prawn and breaded in sesame seeds, deep fried until golden brown and topped with cilantro and small prawn. Beside Oriental afternoon tea set we also got a chance to try Lapsang Passion Souchong, a mix of Lapsang Souchong tea with Passion fruit. The last but not least meal was their signature dessert, Blue Jasmine Sarang Semut. 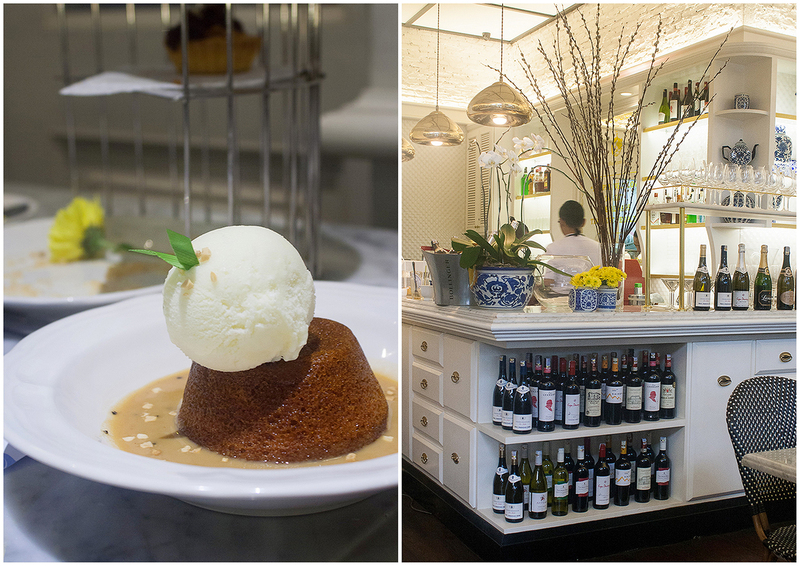 Sarang semut is a caramel cake with a soft and slightly chewy texture, Blue Jasmine sarang semut serve with Earl Grey Sauce and Durian Ice cream. I like their sarang semut cake and the Earl Grey sauce also taste good, but for me it will be much better if it serve with coconut or vanilla ice cream. It was fine afternoon well spent with nice chit chat and delectable tidbits, special thanks to Mas Ahmad Sulthoni for the time you spend with us.